Home / About WP / Why Worker Participation? Why Workers' Participation in Europe? Workers' participation is a Fundamental Right in Europe laid down by the Charter of Fundamental Rights of the EU (Art. 27). Workers' participation is an essential part of the European Social Model. At the same time, worker participation strengthens the European Democracy in practice and the economic competitiveness of European companies. Workers' participation highlights the fact that a company should not be defined by the sole interest of its shareholders and managers but also by the stakeholders (as a principle of corporate governance). Workers' participation means that social interests can be make effective at the level of decision making of a company. 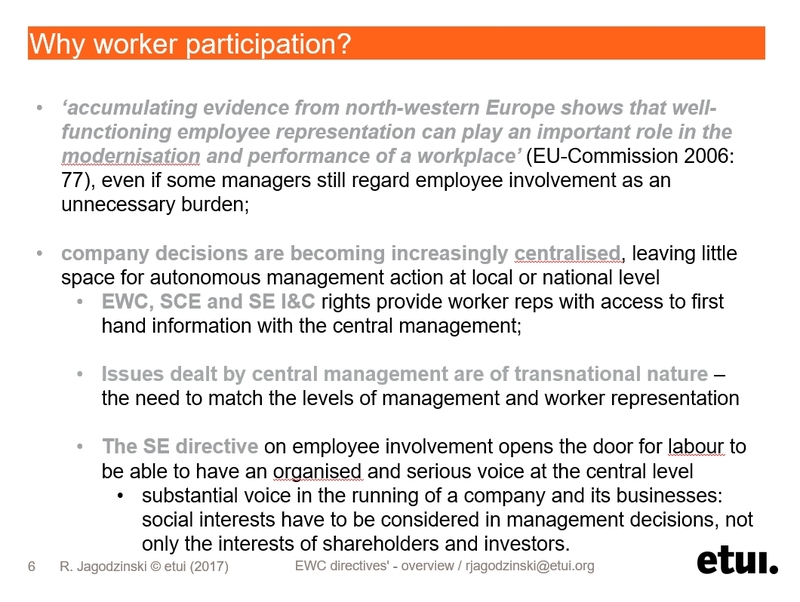 Workers' participation has to be underlined, thus, by European legislation in order to enforce workers making their interests to the same extend effective as those introduced by the shareholders. European legislation ruling workers' participation rights at transnational level is based on a broad political consensus of the European Parliament and among European Governments until today. European labour relations are becoming more and more like pieces of a jigsaw fitting together specific features of national labour relations (which continue to exist) with cross-border elements of interest representation provided by EU legislation, such as the EWC directive and the European Company (SE) directive. The latter are increasingly driving the dynamics of development towards a more comprehensive model of European labour relations by providing tailor-made arrangements for trans-border operating companies. The links between different pieces of the jigsaw are becoming more obvious and visible. The webportal www.worker-participation.eu supports such a holistic view by providing continuously updated empirical and conceptual information on the subject. European Pillar of Social Rights: old wine in new bottles? Politically, the European Pillar of Social Rights (EPSR) reaffirmed social and labour law’s place squarely on the EU agenda. It also raised some hopes for con- vergence towards higher pan-European legal standards. However, when we look specifically at workers’ rights, we see that hardly anything new has been proposed. For the most part, the EPSR merely reiterates rights that have already long existed in the EU acquis. Prime examples of this are the right to equal pay for women and men, the right to equal treatment in employment, and the right to be informed and consulted in cases of business transfer, restructuring and mergers. There are very few new rights proclaimed in the EPSR. The most promising, and most frequently mentioned, is the right to fair wages (see also Chapter 4 of Benchmarking Working Europe 2018). The EPSR also adds a deadline to the existing right to be informed about the terms and conditions of employment: this information should be given at the start of employment, instead of within the first two months, as is cur- rently foreseen in the Written Statement Directive. With respect to dismiss- als, the EPSR establishes the right to a reasonable notice period and the right to be informed about the reasons for the dismissal. Finally, while the Merger Regulation states that workers hve to be informed about the merger, the EPSR add the right to consultation. A collection of good facts and arguments making a case for strong workers‘ voice, by Hans-Böckler Foundation (2017). Worker involvement, through institutionalised social dialogue and worker representation at company level, serves two intertwined purposes: implementing social rights so as to strengthen democracy in the working environment; and supporting companies, States and the European Union in their efforts to combine economic competitiveness with social progress. The second of these two purposes, i.e. the instrumentalist vision of social dialogue and worker representation, was central to the realisation of the Lisbon Strategy which stated: ’The European social dialogue (ESD) could constitute a tool for the modernisation announced at the Lisbon European Council for all key issues on the European agenda’ (European Commission 2002b). This ‘tool’ was so prominent in the achievement of the growth and employment strategy that it led the European Commission to stress, on several occasions, that ESD should be considered ‘a force for innovation and change’ (European Commission 2002b) in the guise of ‘a partnership for change in an enlarged Europe’ (European Commission 2004). Despite the recognition of ESD and its clear positive contribution to EU policy during the 2000-2010 period, social dialogue and worker representation are a resource that the new Europe 2020 (EU2020) strategy appears to ignore. The aim of this chapter is therefore to boost the image of the missing dimension in EU2020 by demonstrating the fruitful outcomes so far achieved at European level by the institutions and practices of social dialogue and worker representation, as well as the need for these forms of action to enjoy recognition by the EU institutions and inclusion in the implementation and purposes of the EU2020 strategy. Worker involvement undeniably mirrors the Lisbon goals at the micro-level constituted by the workplace, making workers into citizens at their workplaces. Worker involvement serves, at the same time, two major objectives: to make social rights effective in order to strengthen democracy and social understanding, and to support companies in achieving economic competitiveness. More than 14,000 members of European Works Councils or works councils in European Companies (SE), supported by their trade unions, have adopted a pro-active role in this regard, particularly in relation to the need to resist and tackle economic crisis without excessive social damage. The type of labour needed by European companies – skilled, mobile, committed, responsible, and capable of using technical innovations and of identifying with the obj ective of increasing competitiveness and quality – cannot be expected simply to obey the employers' instructions. Workers must be closely and permanently involved in decision-making at all levels of the company.